Distinctive features Daystar has handsome features and an athletic build. When he flies, he leaves behind a trail of light. History Daystar's powers began manifesting as a young teenager, and his evil, domineering father, Dark, began recruiting a new team of Omen to commit crimes. After Daystar broke free from his father's controlling ways, he decided to look up his cousin Carl, who had just come into possession of the power ring formerly owned by Nightring. Personality Due to growing up under his psychotic father's rule, Daystar is very suspicious and untrusting of others. However, he does have a heart deep down, and is protective of non-powered people. Unlike his father, he doesn't believe in the use of lethal force. 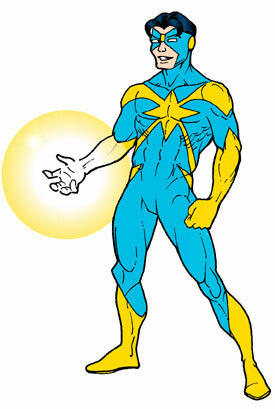 Daystar has a symbiotic link with the sun, which fuels his megapowers. Sunlight increases his strength four times (making him strong enough to lift 1000 lbs. ), and he can absorb ambient sunlight to further boost his strength. He can project solar beams or create realistic holograms. Daystar can also fly and instantly change into his costume in a burst of light. None of his powers work in darkness fields, and his strength level drops to 250 lbs. at nighttime. Skills He is skilled in acrobatics, business management, rollerblading, swimming and surfing.